Dawes Roll applicants listed as Identified Mississippi Choctaws experienced an application process that was different than that of other enrollees. Although most individuals had to live in Indian Territory to apply for the Dawes Roll, Mississippi Choctaws were the exception. Most Identified Mississippi Choctaws resided in Mississippi at the beginning of the enrollment process. The Dawes Commission set up offices in Mississippi and began the process of interviewing applicants. 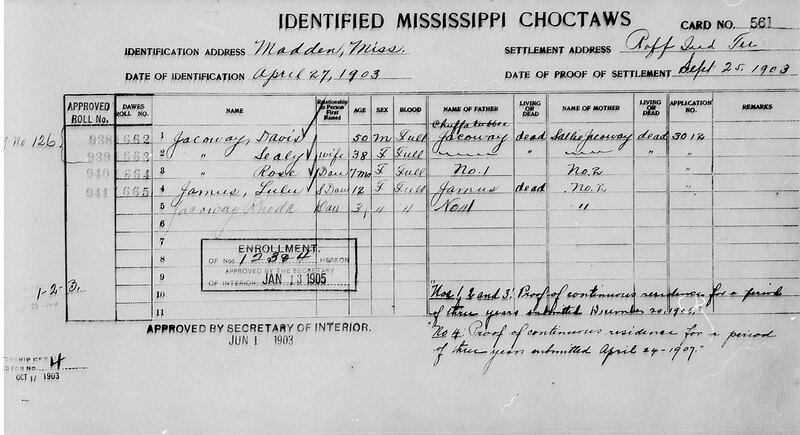 While other tribes maintained records and census rolls that could verify an applicant's identity, the Mississippi Choctaw had few records. The Dawes Commission made judgments based on an applicant's "Choctaw characteristics," such as their appearance or ability to speak the Choctaw language. The Dawes Commission was bombarded with fraudulent applicants from across the US trying to secure an allotment. Applicants who were deemed eligible for citizenship were listed as "Identified." Identified Mississippi Choctaws had to remove to Choctaw or Chickasaw lands in Indian Territory and establish residency. After a period of time, individuals could submit proof of their removal and receive an approved Dawes Roll number and a land allotment. Of the 2,597 applicants listed as Identified Mississippi Choctaws, only 1,457 received an approved roll number. 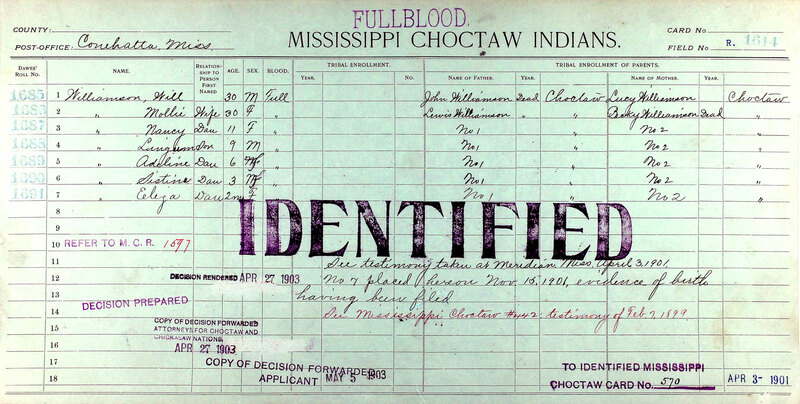 Some applicants died during the enrollment process while others might have been born too late but were still listed on an Identified Mississippi Choctaw card. Those that were identified but did not remove to Indian Territory and submit proof of their residency did not receive an approved roll number. Search the Dawes Roll index. 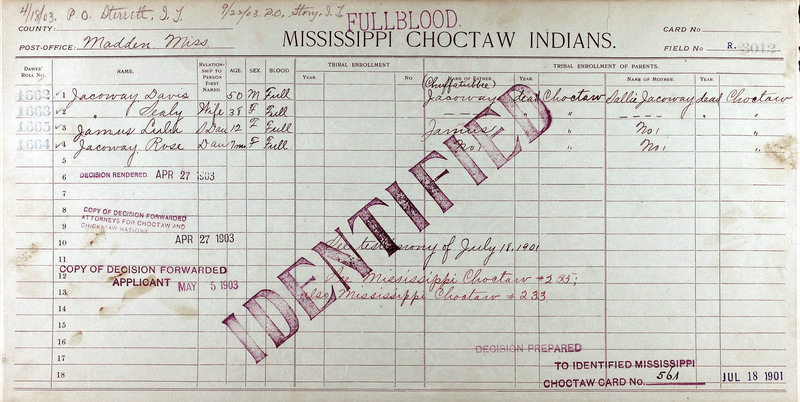 There are three types of enrollment cards that pertain to the Mississippi Choctaw. Some individuals may be listed on each type of card while others might be listed on only one or two of the card types. The differences in the cards are shown here using the example of Davis Jacoway, an applicant who was listed on each type of card. A second example illustrates the enrollment process for the family of Will Williamson, who was also listed on each type of card, but did not receive final approved roll numbers because they did not submit proof of relocation to Indian Territory. 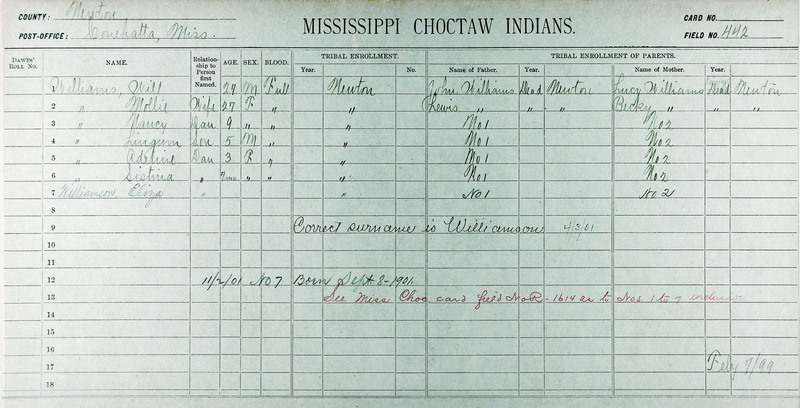 Not all Mississippi Choctaws had an initial field card. Initial enrollment field cards do not include roll numbers. These cards were created during initial contact with applicants in Mississippi; no testimonies or packets associated with these cards have been found. 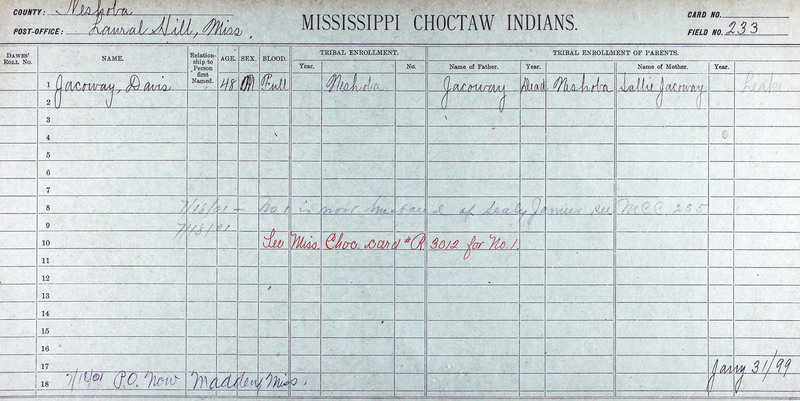 Many Mississippi Choctaws were enrolled on an initial card and then transferred to a Mississippi Choctaw Refused card. Applicants who were not transferred to other cards were not enrolled and have no further documentation. Look for notations on the initial card to find out if the applicant was transferred to another card. Davis Jacoway and his family were first listed on initial field card #233, then transferred to a Refused card. Refused cards were created for most Mississippi Choctaw applicants, due to the sheer number of applicants. Names placed on these cards were deemed “refused” until they could prove their Choctaw ancestry. The Dawes Commission assigned new field card numbers beginning with an “R” on Refused cards. Use the Refused card number to find application and allotment packets. All applications, testimonies, and allotment packets reference the Refused card number, even if the applicant was later transferred to an Identified card. If a person or family was identified, the Refused card will list their Identified Mississippi Choctaw card number. The Refused card may also note which initial card the person or family was transferred from (if any). Davis Jacoway is shown here on Refused card R3012. The card is stamped "Identified," and a notation at the bottom indicates the applicants were transferred to Identified card 561. Applicants transferred to an “Identified Mississippi Choctaw” enrollment card were assigned a new card number. Identified applications also received a schedule number; this is different from the approved final roll number. Identified applicants were given six months to remove to Indian Territory before receiving an approved final roll number. For this reason, both the schedule number and the approved final roll number (if given) are listed on the Identified cards. The Identified cards list both the identification address (usually in Mississippi) and the settlement address in Indian Territory. Applicants who did not remove to Indian Territory and submit proof of residency did not receive an approved roll number. Davis Jacoway is shown on his Identified card. The written notes on the card confirm that Jacoway and his family removed to Indian Territory and provided proof of continuous residence. On the left side of the card are the final approved roll numbers. Will Williamson and his family were first listed on an initial field card, then transferred to a Refused field card, and finally listed on an Identified card. However, they were not issued final approved roll numbers because they did not provide proof of relocation to Indian Territory from Mississippi. The stamped note states the applicants did not submit proof of removal and resettlement within one year from the date of identification. For this reason, they did not receive final approved roll numbers.